Quality 1st Contracting has been repairing and replacing decks on condos for 22 years. We know how to work with condo and coop associations, property managers, and association engineers to repair or replace the floors and railings of roof decks, decks, balconies, and similar structures. Our experienced technicians can diagnose the causes of most water and structural problems and design cost-effective repairs that can be completed quickly with minimal disruption. Quality 1st Contracting is the premier authorized installer for Duradek, a heavy-duty sheet vinyl membrane for waterproofing the floors of decks and balconies. Strong, stabile, slip-resistant, and long lasting, Duradek was developed to solve leak problems over 35 years ago. Older methods, such as concrete topping products and liquid-applied systems, were the only options previously available -- and they failed repeatedly. Property owners and builders complained about leaks, unsightly appearance, expensive repairs and time-consuming maintenance. 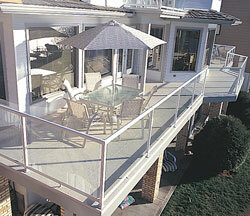 Today, Duradek is the most common deck material in the condo industry. In addition to creating waterproof decks, it can be used to create a waterproof underlayment for decking materials like tile, outdoor carpeting, pavers, or duckboards. Duradek itself is available in a variety of colors and textures, but can also be painted. Duradek installs quickly and can be walked upon immediately – a necessity in many public-space areas. 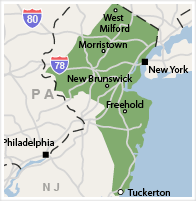 We make and fix decks in Paterson, Jersey City, Newark, Elizabeth, and nearby. Just contact us for your FREE foundation repair price quote!